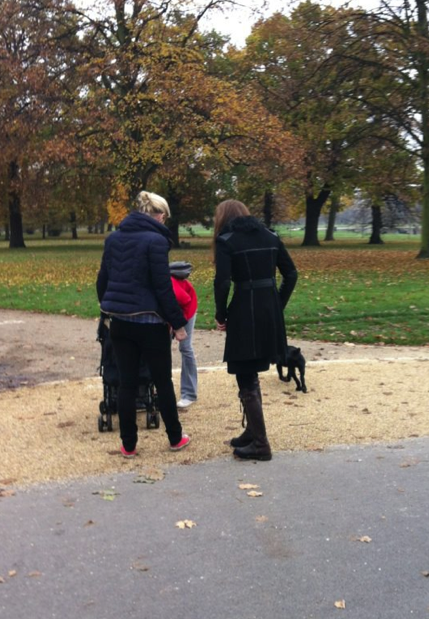 Hello and welcome to a quickly cobbled together post, we begin with a brief look at Kate’s visit to Kensington Gardens yesterday. WKW Facebook friend Sandra was out for a stroll in the Gardens when she was tickled to see the Duchess. Kate isn’t visible in Sandra’s next picture, but it’s fun to have a peek at Lupo. Look UK ran a story earlier this week about Kate wearing Temperley’s Odele coat, that is what she was sporting yesterday, as seen in this photo from Sandra. A better look at the Odele, both in Kate’s black and the oxblood color, available at Fashion Bloodhound. The black runs $3285 at Temperley, here is how it is described. Made of luxuriously soft sheepskin, it has the suede side of the skin facing out and is lined with flat haired sheepskin allowing a snug and flattering fit. The cut is feminine and sharp with a nipped in waist. Leather trim and gold metal hardware complete the look. There is some debate over which boots Kate is wearing, one body of thought is that she is in her Penelope Chilvers, another suggestion is here. 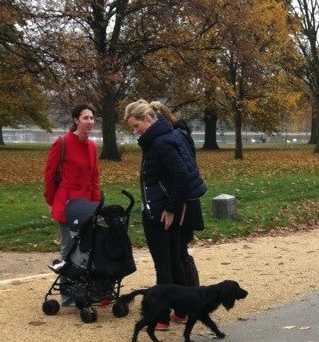 Editor’s Note: Because Kensington Gardens is a public park, I don’t consider this an occasion where Kate would have expected privacy; I am comfortable accepting Sandra’s gracious offer to share some of her photos. On to the larger part of today’s post, the crowded royal calendar in upcoming weeks, following we share engagement dates and some information on the appointments. Saturday, 11/24: Kate attends the Wales-New Zealand Rugby match, kickoff is 17:15 (5:15 ET), the match is at the Millennium Stadium in Cardiff, more info here. 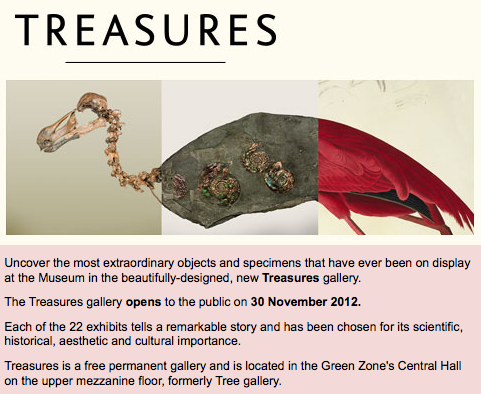 Tuesday, 11/27: Kate attends the opening of the Natural History Museum’s new Treasures Gallery. Joining the Duchess in opening the new Gallery, Sir David Attenborough, more on the event from the Museum. The Duchess will view 22 of the most extraordinary specimens that have ever been on display at the Museum, brought together to form the inspiring Treasures gallery. From the 200-million-year-old nacreous ammonite that led William Smith to discover that the rocks beneath our feet are layered through time, to the rare first edition of Charles Darwin’s On the Origin of Species, these objects reveal the heart of the Museum’s collections. Learn more about the Gallery here. Wednesday, 11/28: William & Kate have four engagements in Cambridge, the city from which their titles come, and one in nearby Peterborough. Following are some of the details about the day’s events. The pair then travels to nearby Peterborough, where they official open Peterborough City Hospital. Saturday, 12/8: the Duke and Duchess take part in the Winter Whites Gala at London’s famed Royal Albert Hall, this is a fundraiser for Centrepoint, of which William has been Patron since 2005. 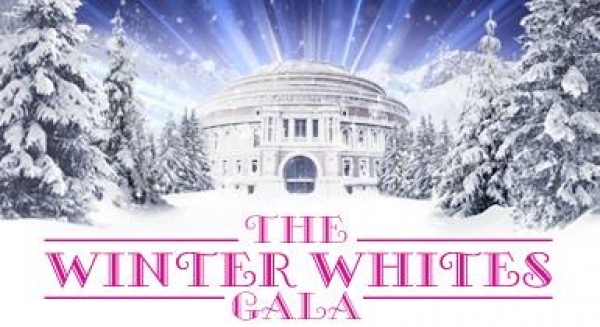 The Winter Whites Gala will see the Royal Albert Hall, a UK charity itself and host of the Statoil Masters Tennis, transformed into an enchanted Winter Wonderland, featuring some of the biggest names in sport and entertainment. Tennis greats John McEnroe, Bjorn Borg, Boris Becker, Ivan Lendl and Chris Evert have all confirmed their attendance. McEnroe will play a match, with Lendl, Borg, Becker and Evert in attendance to lend their support. This function features a ‘white carpet’ arrival for celebrities, champagne reception and silent auction. Sunday, 12/9: William & Kate attend the British Military Tournament, we posted about it at greater length here (scroll past Remembrance Sunday coverage). Wednesday, 12/12: Another black tie event for the couple, the premiÃ¨re of â€œThe Hobbit: An unexpected Journey“. This function is a benefit for the Cinema and Television Benevolent Fund, it is preceded by a Pre-Premiere Reception at the Hampshire Hotel. Limited tickets remain, more information may be found here. First, we note that two years ago today William and Kate officially announced their engagement, to enjoy some oversized photos from that era, click here. 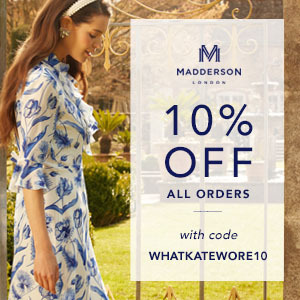 If you’ve not already entered our Links of London giveaway, to join the fun, click here! 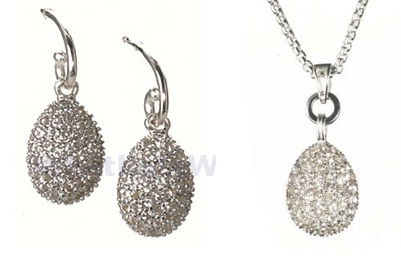 The Hope Egg Earrings and Pendant shown below are part of just one prize. I love her style, but with free money from Prince Charles for sure she can affort to have every nice and expensive things in her wardrobe. I love the coat which she wore to visit Cambridge, but I wonder why she put the bell on her perfect coat with the bow upside down. It might be a minor thing but it appears just right infront. New fashion of the Duchess ? A negligence ? A mistake from her staff ? I follow all the articles wrote about her, every time she wears nice dresses they say because she has good taste, and if there is a defaut …ooop mistake of someone else (remember the robe she wore for official diner with the government on the island Salomon, first people praised “ohhh perfect”, and next day the UK government found out it’s not an appropriate robe and blaim her secretary). Be fair ! Perhaps it is a good idea to fully write down any dates; the date 12/9 is the 12th of September to me. After reading it twice I finally understood that the 9th of December was meant. This coat appears to have military style influences, which is very on trend right now. Personally, however, I just don’t care for this coat; it looks too similar to the costumes worn in The Matrix. The leather cuffs (I guess you would call those cuffs?) on the sleeves really bother me… Paired with those boots, the look is altogether too harsh. I do really enjoy the fur trim on the collar though with the overall silhouette. wow ! A luxury dog walking. First of all, love this blog!! Second, i love the coat! Also, for some reason, I can’t comment on the Great Links of London Giveaway so I’m posting here that I would love to see the Duchess in Links’ 20-20 Multi Circle Necklace, it’s very modern but classy! Wow, a $3000+ coat for dog walking? While I like it, it seems a bit much for a walk in the park. Does anyone else think that all of these increased appearances foreshadows William’s departure from the Air Force? It is certainly understandable if they are being asked to ratchet up their royal duties but seems kind of sad since he’s frequently spoken of his happiness with his military career. And they both seem heppy with their fairly normal life in Angelsey. Too bad it has to come to an end, especially since Charles is still 1st in line to the throne. Perhaps William and Kate feel the time will soon be right since they are getting their London home ready for habitation. I’m glad to see Kate really throwing herself into her royal duties and charity work. It helps keep the criticism at bay (those appearances look like they might be fun, but I’m sure it gets wearing to have to go out for hours at a time, travel, make small talk with everyone, etc.) – just imagine what people would say if she just spent her time only getting her hair done and shopping! I’ve read repeatedly that the Duke and Duchess were to be given a year to adjust to married life before taking up royal obligations full time. I have no doubt that part of them wishes they could remain in Angelsey for much longer, but I’m sure they recognize William’s obligations as heir, second in line though he may be. I agree with you that it is sad considering their obvious contentment with their life in Angelsey and William’s love for his RAF job. Terrific post! So many appearances coming up!!! who is that with the duchess? I think Kate should get the Links “BUTTERFLIES IN MY TUMMY” 18 ct gold with diamonds heart shaped pendant. Kate should put this on her bracelet Camilla gave her with her Royal insignia. This pendant could have a few meanings, one could be for all the royal engagements and speeches she gives must give her butterflies in her tummy, also when she gets pregnant, people say it feels like butterflies in their tummy when the baby moves. Thanks for the opportunity to win such iconic pieces that Kate wears all so often…I have also put this on Facebook and will tweet it now…Thanks again.. This is such a gorgeous coat! I love the leather sleeves. I think the cut of Kate’s coat is fine. But the black stitched leather trim is a bit much. That is one expensive coat to be wearing to walk the dog! It’s not quite my style but nice anyway. And I appreciate being informed that we have quite a few engagements of potential fashion interest coming up. I enjoy more seeing pictures of the beloved Duchess in casual occasion. Thank you for the post. The coat looks so sleek on her. The website picture actually looks bit bulkier, for some reason. Wow- great post! And I LOVE the coat in black. Very regal! Great spot of the Duchess! The link to the over-sized photos seems to lead me to the Odele coat. Cathie – I sigh with you – being Canadian and unable to enter! I’m so looking forward to their upcoming schedule! I’ve been having withdrawals! Admin – FYI, the first link under “Two other quick tidbits” at the bottom of the page are linking me to the Temperley website. Is it supposed to? Wonderful post as always, Susan!